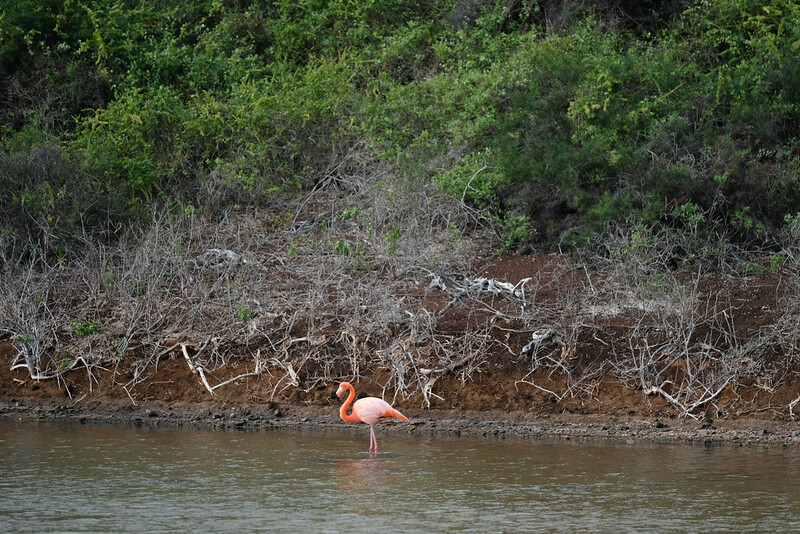 After visiting Fernandina Island on day 5 of my Galápagos cruise, we started day 6 exploring Rábida Island. This is one of the places that I’d really been looking forward to checking out. As a beach lover, I’m always ready to explore new and interesting coastal spots. 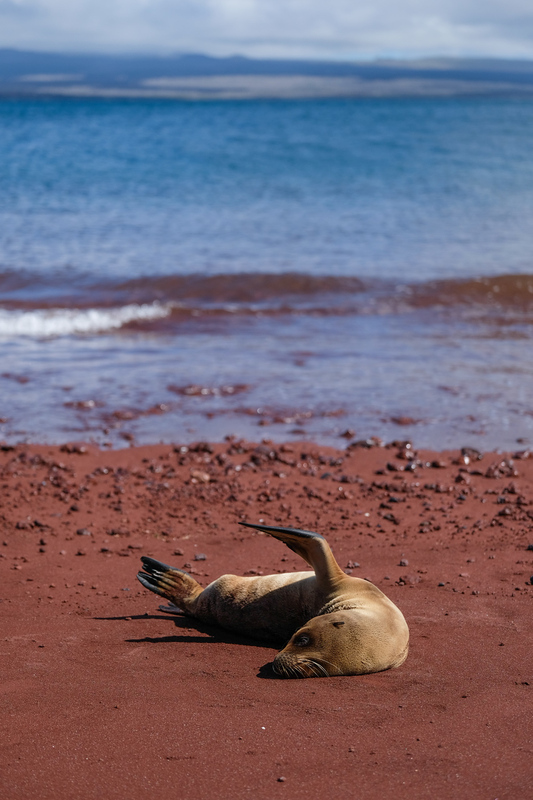 I’d heard about the red beaches of the Galápagos, so they’d been at the top of my checklist for a while. This ended up being one of my favorite stops along the cruise! We visited Rábida Island with the conservationist guides from onboard the MV Origin. They took us on an educational hike around the island, leading us to lagoons filled with pink flamingos and up hills to incredible viewpoints. 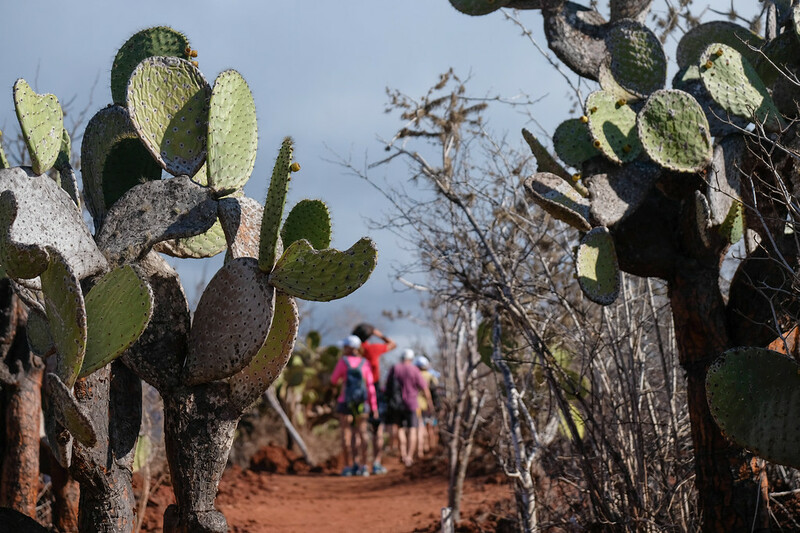 We passed lines of Galapagos Cactus and Palo Santo trees, spotted brown pelicans nesting, marine iguanas lounging on the warm rocks, mocking birds and yellow warblers as we made our way along the trail. 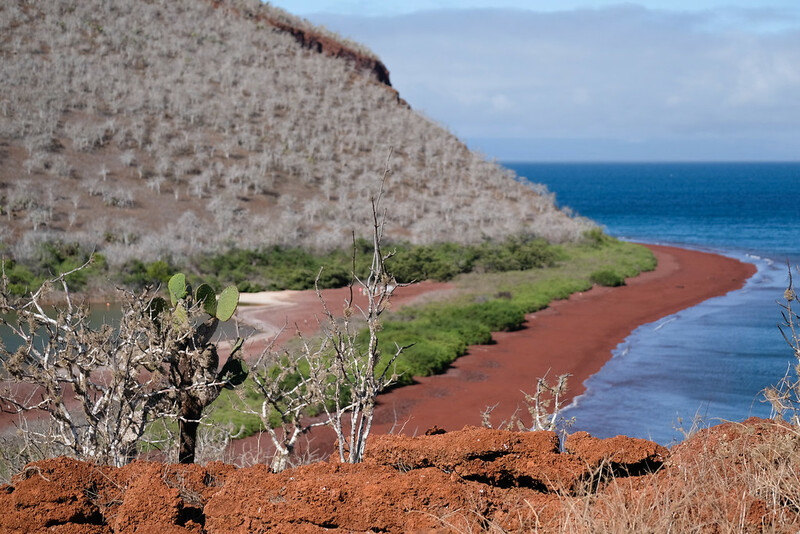 On one side of the island, you can hike up a hill for an amazing view of the red-sand beach below! 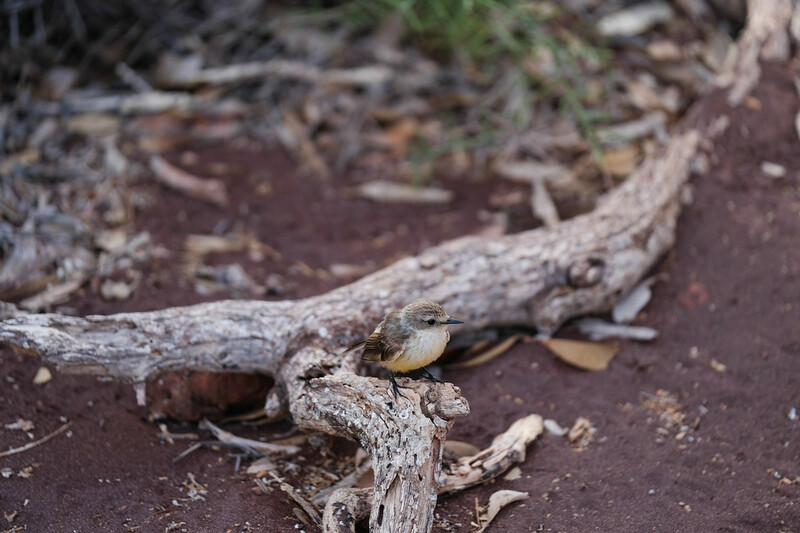 The conservationists shared information on the Blue-footed and Nazca Boobies, which can be found nesting along the coastline, as well as the rarest species of birds that can be seen in the Galapagos, such as the Galapagos Hawk and nine different species of Darwin Finches. Sure, we all love white-sand beaches, but there’s something magical about colored beaches. The vibrant red sand of Rábida Island (red, from high iron content) and its rough volcanic coastline are absolutely stunning. While this isn’t the kind of beach for lounging around for hours, it makes up for it by being ultra-photogenic. 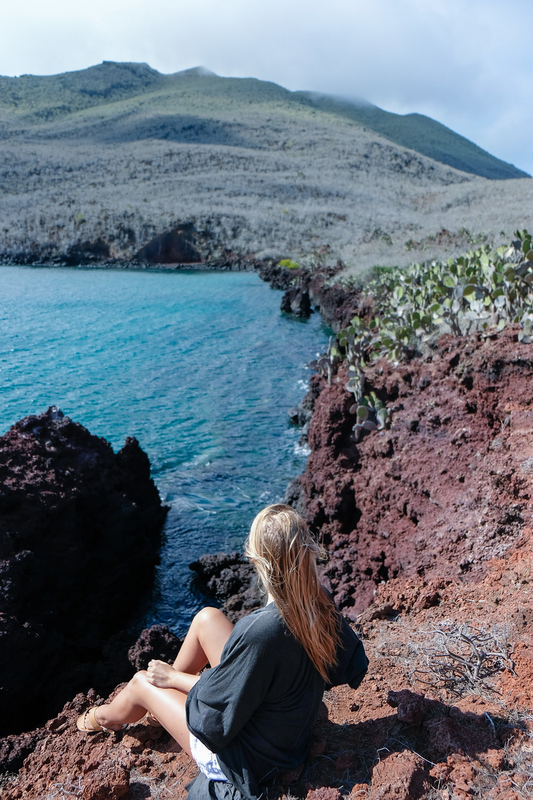 Rábida Island has beautiful turquoise water, and the red coastline is dotted with cacti. Helpful Tip: The beach isn’t smooth here, so I don’t recommend going barefoot. You will want to bring your water shoes or at least some good sandals to walk around. 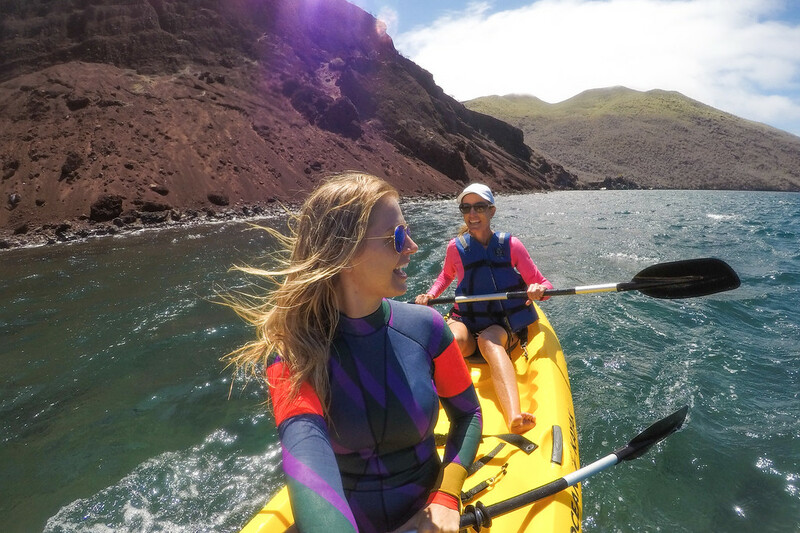 The water around Rábida Island wasn’t as cold as the water in other places in the Galápagos, so I got to snorkel in a shorty wetsuit without freezing, which is always a good thing. I saw some big fish and a few sea lions swim alongside me. There are supposed to be a lot of sharks in the area too, but I didn’t get the chance to see one. After checking out the undersea world, I was ready to see things from slightly above sea level again. We were able to hop on a kayak directly from the beach then get out to see Rábida Island from the surface. WATCH all of my Galápagos videos! Oh my gosh! I’ve always wanted to see a rand sand beach! How amazing! I’m so envious of your Galapagos trip. One day I hope to make it there!